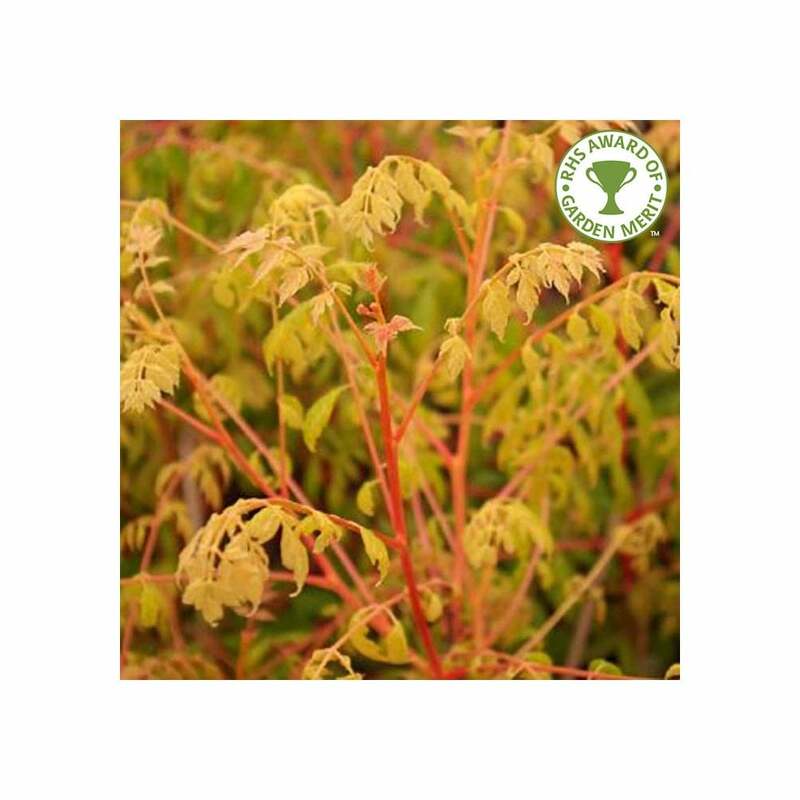 A very unusual and rare variety of small ornamental tree, the Golden Rain Tree or Koelreuteria Coral Sun produces striking, coral red shoots and leaves in the spring. The almost fern-like foliage turns lush green throughout the summer with the stems often keeping their red colouration. In a good, clear autumn expect to see a display of yellow and orange autumn colour. The amazing foliage colour is not the only appeal of Koelreuteria Paniculata Coral Sun, in July-August expect a sea of golden yellow panicles of flowers, as if it were raining gold! The fruits that follow the flowers are also most attractive. This fantastic small garden tree will grow to just 4 x 3 metres in 20 years and so is the ideal feature tree for even the smallest of spaces. The Golden Rain Tree is pretty tough and hardy but requires a sunny position and will tolerate atmospheric pollution and dry conditions. Our pot grown Golden Rain 'Coral Sun' trees can be planted at any time of the year. Firstly, remove all weeds and grass within a metre of your desired planting hole. Dig a square hole as deep as your root mass and approximately 2x as wide. To help your tree establish more effectively, we advise applying Mycorrhizal root grow (sprinkle in the hole for pot grown trees), especially if you have poor soil. Gently loosen the tree roots and place into the planting hole. If your soil is poor, mix 50% of the original soil with 50% high quality compost, fill in the hole and firm around gently. Make sure not to bank the soil up around the collar of the tree. We recommend planting 'Coral Sun' trees with a stake and tie and if needed, a rabbit guard. The advice section has further information. If you’re planting Pride of India trees in spring, summer or dry weather, water well and regularly for the first few months. Make sure to keep an eye on young trees and increase watering if there are extended periods of hot or dry weather. If you’re planting in autumn, you may only need to water your tree a little. Once planted, keep the area free of competing weeds and grass for the first couple of growing seasons. Installing mulch matting will aid in this. Do not just mow the grass in the area as this will only encourage it to grow more vigorously. Golden Rain 'Coral Sun' trees do not require regular pruning. If you wish to tidy up your tree, do this during the dormant season. Focus on removing any damaged, diseased or overcrowded branches. If you require a clear trunk, remove any side shoots to help raise the crown.